Our Reservations will fill up quickly so be sure to head to our website at www.McCurryRentals.com to pick out the right van or car rental for you and book your reservation or call 256 230 0232 to speak with one of our professional rental agents. Use Keyword "x-mas blog" to get 5% off of your rental this Holiday season at McCurry Van and Car Rentals for reservations until New Years Eve, 12/31/2017. Halloween, and Thanksgiving have come and gone but now Christmas is right around the corner and everyone is quickly preparing for this yearly celebration. Hollidays are our busiest times and reservations book quick. Both of our locations, Huntsville, and Athens, AL can provide whatever van and car rental you might need. Reservations fill up quickly over especially for Holliday and big weekends so visit visit our site www.McCurryRentals.com or call us at 256 230 0232 to book your reservation today. We require Credit Card, Drivers License and Proof of Insurance. Whatever your transportation needs may be we have you covered at McCurry Van and Car Rental. 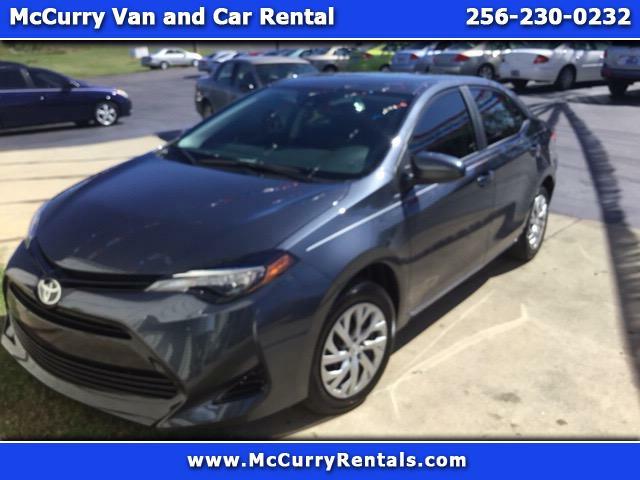 We provide everything form car rentals like our fleet of 2017 Toyota Corollas that are great on gas to 15 people Ford Transit passenger vans and everything in between. 12 people Mercedes Sprinter Vans, 12 passenger Ford Transits, Eco Line 10 and 12 passenger vans, Tahoes, Suburbans, and mini vans. If you need Holliday Transportation pick McCurry Van and Car Rental and let us take care of you this Holliday season! New 2017 Toyota Corollas Are Here! McCurry Van and Car Rentals has just added 10 new vehicles to our Rental Fleet in Huntsville, Alabama! We have just added 6 brand new 2017 Toyota Corollas to our rental fleet. These Toyota Corollas are brand new, state of the art, great gas mileage vehicles and are great rental cars for any occasion when you do not need the extra room or size of an SUV or Passenger Van Rental. Comfortably seating 5 people the Toyota Corollas are great for work trips, insurance claims, and just good driving vehicles! We have also added a couple of new 12 people passenger vans, 15 people passenger vans, and Suburbans. Check www.McCurryRentals.com to check out photos of these great new vehicles and book your car rental, van rental, SUV rental, or passenger van rental today at www.McCurryRentals.com or call us at 256 230 0232!